Back when Tron Legacy released, I had huge interest in it. All I knew was it was the sequel to a cult hit from almost 30 years ago. I was determined, though, to watch the original first. Unfortunately, Netflix didn't have it for rent so I saved it for later. Months went by and it all of a sudden appeared in the mailbox. I'm glad I saw Tron before Tron Legacy. I don't think it's necessary, but it certainly added a lot the sequel. Tron is a technological marvel for being released in 1982. It featured the most extensive CGI ever up to that point and, at the time, it looked amazing. The concept was so new, in fact, that Tron was disqualified from being nominated for the special effects award at the Oscars. Back then, they believed that it was cheating to use computers for effects. Even today, the movie remains truly remarkable in that respect. Sure, it looks cheesy, but it's the good kind of cheesy. In fact, the movie in general reminded me of an episode of the Twilight Zone. Everything from the costumes to the music emanated that vibe. But I'm getting ahead of myself. Let me explain a little about the movie. I think this movie was somewhat of a flop when it came out because people at the time just couldn't understand it. The story revolves around Kevin Flynn, a former software programmer for ENCOM and now arcade-owner, whose game programs were stollen by colleague Edward Dillinger. Because Dillinger passes them off as his own, he's quickly promoted to Senior Executive. After unsuccessfully trying to hack into the system, which results in the lockout of particular employees for safety reasons, he enlists the help of his friends and current ENCOM employees, Alan and Lora. They decide to try and extract Flynn's original files from the computer mainframe, thereby proving that Dillinger didn't create them. Standing in their way is the Master Control Program, which runs computer operations for ENCOM, that is beginning to take on a mind of its own. While attempting to hack into ENCOM's system, Flynn accidentally activates the experimental digitizing laser and is transported into the computer. He discovers an entire digital world being oppressed by Master Control. Flynn then sets out to help Alan's security program, Tron, in bringing down Master Control. I'm not going to spoil what happens, but you can probably guess anyway. Although it is a bit difficult to discuss Legacy without giving some things away. Light cycles. These were the greatest effects ever, at the time. Computers and computer games were so new at the time that I don't think people could quite grasp the movie's concept. They certainly couldn't grasp the idea of having a digital representation of oneself (an avatar, if you will). In essence, the film was ahead of its time both technologically and with the themes it presented. While in digital world (known as The Grid), Flynn begins to learn that there is a sort of religion among the computer programs (in The Grid, computer programs are represented by people). Some believe in The Users, or, essentially, the fact that they were created by a higher power. Others, such as Master Control, try to quell such beliefs. Being a user, Flynn discovers over the course of the film that he has special abilities while in The Grid that normal programs do not have. Similar to how a programmer can create something out of nothing by using code, Flynn can perform "miracles" of sorts within The Grid because he has the power to manipulate data. The movie is full of interesting themes ranging from technology to religion to free will. As for the presentation, it obviously looks dated but there's something really mysterious and appealing about it. I don't think I'd want it changed. Tron has a certain vibe to it that Legacy (which, to be fair, has its own vibe) just can't replicate. Like I said, it reminded me a lot of the Twilight Zone. The costumes looked ridiculous, everything was dark and a bit eerie with soft glows of color, the music was straightforward 1950s sci-fi fare. There's a strange sense of isolation and mystery as you follow Flynn through The Grid. But there's also something really lovable about it all. It doesn't have the feel of a blockbuster in the least bit, but you can't help but get sucked into the unique atmosphere. As strange as it all sounds, I found this movie to be highly engrossing. I'm sure that seeing it today is a much different experience than seeing it 29 years ago, but I think it's definitely more relevant now than it ever was. It reminds me, slightly, of the Matrix in respect to the themes and ideas it presents. And this is what a light cycle looks like today. Tron Legacy is both similar to Tron and different from it. It takes place about 20 years after the original Tron. In that time Kevin Flynn fathered a child and disappeared without a trace (*spoilers! * he was put in charge at the end of Tron when the truth got out about Dillinger, making his son the biggest shareholder). His son, Sam Flynn, is reckless and immature, constantly screwing around with ENCOM for fun. Alan, now on ENCOM's board of directors, visits Sam one day to let him know he received a page (yes, a page) from his father's office at the now-abandoned arcade and urges him to investigate. Sam gives in and soon discovers a secret office behind one of the arcade machines. In it is an isolated computer server and the old digitizing laser. While investigating, Sam is transported into his father's computer and onto The Grid. Though the look has changed substantially (both because technology has advanced in regards to CGI and time passing in the movie's universe), it is still the same computer server from the first movie. The reason why anything is the same at all is because it's been isolated from things like the internet and networking for 20 years. Once inside, Sam soon meets the film's protagonist, Clu, a program make by his father and in his father's image who has taken over The Grid on an idealized mission to rid it of imperfection. Eventually, Sam does find his real father who explains that Clu was following his programming too literally and has taken corrupted or broken programs and turned them into mindless soldiers. In the meantime, a subplot is introduced to explain why Flynn was trapped in the computer to begin with. He one day discovered "isos" on the grid, which are programs that came into being on their own without a User creating them. Thinking this was the next step in evolution, Flynn worked tirelessly on studying them before they were wiped out in a genocidal campaign by Clu, who deemed them to be imperfect beings. There's more to it than that, but you should really watch and find out for yourself. Although the movie has its own interesting themes, look, and feel, I can't help but draw parallels between the two. I think the similarities have a lot to do with the huge span of time between the releases of them. 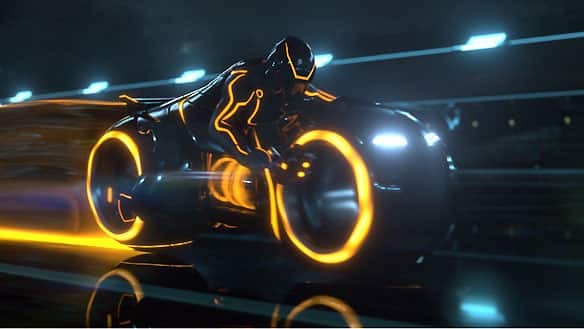 Because most of the audience of Tron Legacy would not have seen Tron, or at least not remember it, just about everything had to be introduced again. And so we follow Sam this time on his journey of discovery through The Grid. That's not to say there isn't anything new in it for fans of the original. In fact, I think you'll get more out of it if you see Tron first. But the movie is made in such a way that you don't have to watch Tron first for this movie to make sense or to be enjoyable. It certainly is a bigger and better production that actually has the feel a theatrical film. The special effects are fantastic in Legacy. Jeff Bridges plays both Flynn at his current age and Clu, who is modeled after the Jeff Bridges of 29 years ago. That's pretty impressive right there. It looks good, too, though I could tell it's a CGI face with all the detail that Blu-ray brings to the table. That's not necessarily a bad thing, though, as Clu is supposed to be a digital creation anyway. I also found the cast to be very strong in this one. The characters are definitely more memorable, at least. Although I think the movies are on-par in most respects (especially considering when they were released), there's one aspect where Legacy easily wins: the music. The costumes dont' look goofy this time. The Tron Legacy score is easily one of the most memorable in recent memory. For me, it's easily one of the most memorable period. 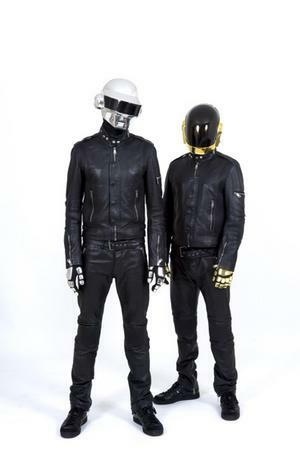 It was composed by French electronica duo Daft Punk. Maybe you've heard of them. As unlikely as that seems, it's phenomenal. Yes, they had use of a full orchestra but it's the expert blend of acoustic and electric sounds that really does it. It's instantly memorable and instantly awesome, unlike the completely forgettable Tron soundtrack. I'd never listen to that one by itself. But this? I already bought this one. I think the reason I like it so much has something to do with it not sounding like every traditional movie score. It's epic, but not in the way you'd expect. And one of the most memorable scenes in the movie involves Daft Punk. Yep, they're actually in the movie at one point. They fit right in. Overall, I recommend both Tron films. If the premise sounds interesting to you, I'd definitely check them out. And if you're just thinking about Legacy, I'd say you should reconsider. Tron is an excellent film that shouldn't be missed simply because it's old.